Fitting two babies in our small safari friends nursery wasn't on my mind when my first baby was born but eventually I have had to do just that! In February we moved our little family from PR To WA into a small apartment. Then in October I found out that I was pregnant again! Yes, we have another baby on the way so soon! That was a big, unexpected surprise that I was not exactly prepared for! Our apartment is small and the room that we made into the nursery really doesn't have much space. It has been a real challenge to figure out how to put everything the two infants will need together within a very small area! 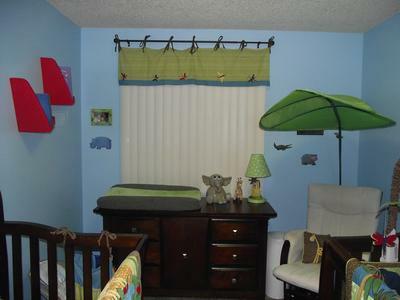 We had to add another crib and find places to store each little one's clothing, toys and items needed for their care and diaper changes and what you see in the above nursery pictures is the result; We made a miracle happen in a small space! 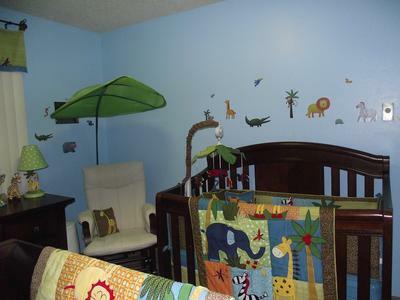 We kept the walls of the babies' room a light color to make it seem as open and airy as we possibly could and added cute decorations that reflect the colors and style of their safari baby bedding sets. I decided on a safari friends nursery theme because I fell in love with the idea of surrounding the little ones with baby animals and I hope that you like it, too! Please visit Unique Baby Gear Ideas again soon to see more cute nurseries decorated by amazing moms. 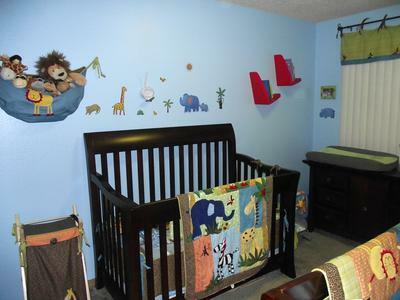 I do not understand why anyone thinks they need a huge room and so much stuff in a baby's room. Your babies will not care one bit that the quarters were close when they were newborns; they will not remember anything other than how their parents loved and treated them.